On October 7, 1918, the last day of this year's Annual Fleet Week, Bay Area CODEPINK collaborated with 3 local “sailors,” to create a powerful visual display of peace in contrast to the U.S. Military’s effort to promote and glamorize war and aggression. As the death-making Blue Angels soared overhead, terrorizing pets and wildlife, and polluting our air and water, our beautiful Peace Flotilla sailed along the bay, up and down the shore line of Crissy Field, giving hundreds of shoreline onlookers an alternative perspective to military power and aggression. Large colorful Peace Flags and Earth Flags flapped in the wind to further promote our cause. “Our message to you, your friends and families: Please avoid the Air Show because it promotes war and is designed to recruit youth into wars." (See full leaflet below). Hopefully, next year there will be less onlookers! Interestingly, of all the hundreds of boats on the water that day, the U.S. Coast Guard, with the help of a San Francisco Police Boat, chose to board OUR catamaran, uninvited. Are peace messages such a threat to the well-being of our bay? Or, are we too much of a threat to the dominant propaganda of the day that propagates a war mentality that normalizes murder. Not surprisingly, the Coast Guard boarded unnecessarily, as our Captain, Jan Passion, had all regulatory requirements in place. Unfortunately, media coverage was minimal: One KQED radio reporter boarded our catamaran before we departed the Richmond port and interviewed Captain Jan and other activists. A NBC network crew just missed us after after we left port. The SF Chronicle did a pre-Flotilla report and Jackie Barshak had some media interviews by phone before boarding her boat at Aquatic Park. MOST IMPORTANTLY: WE WANT TO DO THIS AGAIN NEXT YEAR. We need your help to make this an annual affair. With more boats each year, including, hopefully, a kayak contingent, our alternative voice to war mongering will be louder and stronger! Can you help us to make this grow? Can you help us to recruit more boat owners? Will you help us make this grow? Imagine a Peace Flotilla of 20 or 30 boats on our beautiful bay. With your help we can make this grow! We need other help to: Artists to make banners, media crew for better coverage and a larger land crew next year. Jan Passion, Jim Taggart, and Mark Stafford for offering your beautiful boats to our Peace Flotilla. Susan Witka and Barbara Briggs-Letson who devoted a day or more to sail painting, and Peace Flag making. Jackie Barshak for writing the media release, banner making and pulling loose ends together. Rebekah Bowman for the most amazing photographs. Barbara, Fred Bialy, Ellen Hornstein and Jackie for facing the maddening crowd crazed by high powered killing machines, and helping them to think more deeply. David Hartsough for his inspiration! The Great Spirit and Mother Earth for giving us a most glorious and sunny October day, with perfect sailing weather and a stunningly gorgeous bay to display PEACE to the world. 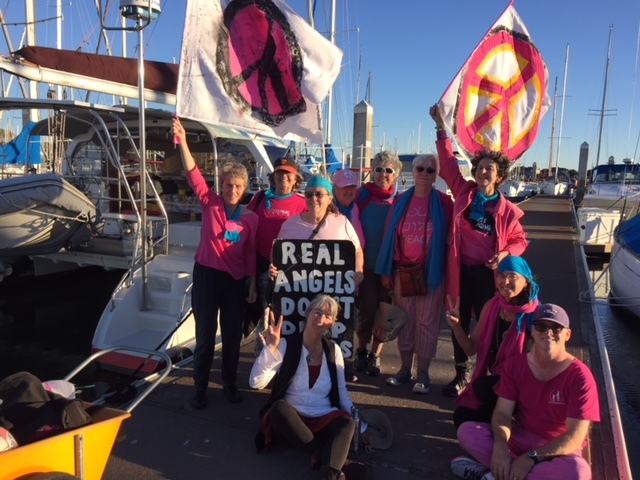 On Sunday, October 7, 2018 members of Codepink, Veterans for Peace and other peace organizations will be protesting the Blue Angels AirShow’s celebration of war and militarism from boats on the bay with messages of peace. Organizers and boat crew will be protesting the AirShow’s display of militarism, the promotion of war, and the surveillance and reconnaissance capability of the Navy’s killing machines. Veterans for Peace, one of the sponsors of the event states “the U.S. military uses the Blue Angels AirShow to bolster recruitment, the aerial acrobatics are designed to lure and recruit youth to serve in war”. Organizers are intending their messages of peace to provoke questions about the need for war. As we face massive social spending cuts, converting our huge military complex and war economy to peaceful means and sustainable production is our highest priority states Codepink member and organizer Jackie Barshak. “We will not collaborate with these instruments of war that perform airstrikes, dropping bombs in Afghanistan and Iraq. We are asking families to avoid the AirShow and the entertainment value of promoting war”. Press Conference (2) San Francisco, 11:30 a.m. October 7, 2018, 42’ Ketch Launch, Aquatic Park – Corner of Hyde and Jefferson.